LKT’s commitment to CPD is something we’re incredibly proud of, and we tap into a variety of resources – in-house and external, national and international – to ensure that we are always at the cutting edge of developments, helping to shape the future of our industry. This coming week, Louise will be in Vienna for the 22nd ELIA Networking Days. Founded in 2005, the stated mission of the European not-for-profit trade association of language services is to accelerate its members’ business success. 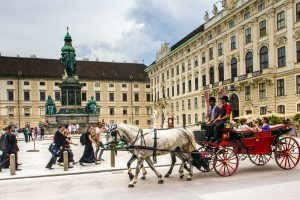 The 2-day event in the Austrian capital is aimed at anyone involved in running a language service company of any size, and Louise is looking forward to hearing what industry experts have to say on a diverse range of issues facing our sector, as well as engaging in dialogue with them. There’s even going to be an opportunity to learn how to waltz at Thursday’s Gala Dinner – don’t forget to pack those dancing shoes, Louise! Lead translator Catherine Entwistle will also be on the CPD trail in October. Staying a little closer to home, she’ll be attending Peak Translations’ 40th Anniversary Conference at the Imperial War Museum North in Manchester on 5th October. We’re delighted to be represented at this celebratory event and offer Helen and her team our warmest congratulations on reaching this milestone. With a packed agenda of speakers addressing topics including post-editing of machine translation and multilingual SEO, the event will be a fantastic opportunity to enhance our skills and learn about a fellow language service provider’s visions and aspirations for its future and the sustainability of our industry. Rounding off a packed October for CPD will be our autumn LK Team Day, which will bring the in‑house team together to address various topics that are of relevance not only to LKT’s ongoing development but also on a wider scale at sector and industry level. On this occasion we’ll be “CPD’ing the CPD”, so to speak – dedicating the day to a review of our own approach to training and development and discussing how we might be able to share our ongoing learning with our peers. In November our CPD activities will continue apace: Louise will be in Germany for a customer’s partner summit and the tekom trade fair, at which several of our partners will be exhibiting. This trip will provide yet another excellent opportunity for learning and the exchange of good practice. We’ll be reporting on our attendance at all of the above events, so do watch this space! Finally, following the success of our inaugural event in late 2017 (pictured below), we’re in the early stages of planning our second LK Team Day for in-house employees and external freelance partners, which we hope will take place in early 2019. We’ll keep you posted as our plans take shape!